← Preservative and cage free lunch in rural Florida. Vern and I picked up two core motors on Saturday. Vern knew the owner very well, and he had them both for more than 25 years, stored inside, in a dry place, but not sealed. Vern even knew the Corvair collector, another friend who sold these engines to the man we brought them from. 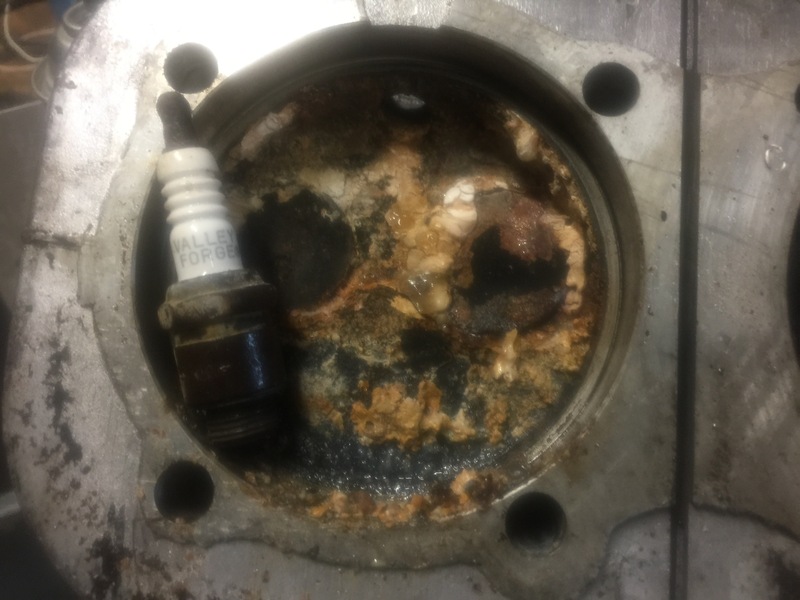 Below are some pictures to illustrate why you should carefully store your engine following the advice I wrote in this story: Storing a completed engine. Upon inspection, each engine had 2 cylinders which were clogged with corrosion. Why? because on a Corvair, one exhaust valve on each side of the engine is always open. If the exhaust isn’t sealed, or the engine isn’t in a bag, over a long period of time, those cylinders will rot. 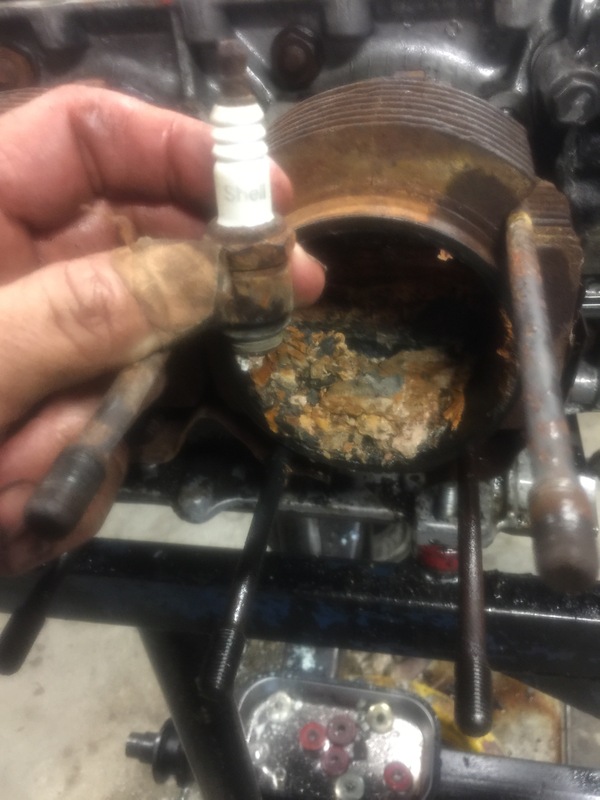 This is why I have always said to bring a 3/4″ wrench and turn the engine 360 degrees to make sure it doesn’t look like this inside. These motors didn’t rotate at all, although they were probably perfectly fine when pulled from a car thirty years ago. Above, “Weird scenes inside the gold mine” . Think about how many times someone has told you the BS that lead in fuel is “good for valves” as if it was the 11th commandment. I have said this a zillion times: “The byproducts of combustion of leaded gas are highly corrosive in the presence of any moisture.” Leave it for a week , or a month, fine, but not longer. This is why we use unleaded fuel to break in motors at colleges, because they will be stored before use.This engine probably did run great the day it was pulled from a car. But with the exhaust left open, it formed this corrosion in two cylinders. The engine was filled with lead, so I am guessing the last time this engine ran in a car was in the mid 1970s. Historical note: I have been working on engines for decades, but I have never seen a Valley Forge brand spark plug. Maybe the specialized in the cold end of the heat range. Judging a book by it’s cover story: When we got the engines back to my hangar, I knew they were going to need a fair amount to work, so I broke out the pressure washer and the 375,000 BTU steam generator. Combined with a generous dose of purple cleaner, the engines looked very good on the outside in a few minutes. When engine shopping don’t care if the engine is clean, only if it rotates. Counterintuitive Grease Monkey Experience: an engine that is covered in goo on the outside constantly leaked oil, and thus had a continuous oil change going on. This motor invariably looks better inside than one which drove the last 3 or 4 years without an oil change. Besides, an oil leak core motor began the “self cocooning” anti-exterior corrosion process before hibernating a few decades waiting for you to need a flight engine core. Above, another hint at how long this motor was stored: When was the last time Shell sold spark plugs? Look at the size of chemistry project going on in Cylinder #2. Part of what drives this process is the fact Corvairs have aluminum heads and iron barrels, diving a dissimilar metals factor an all iron car engine would not have. In a core like that I am guessing that the affected cylinder and piston go into the scrap pile. 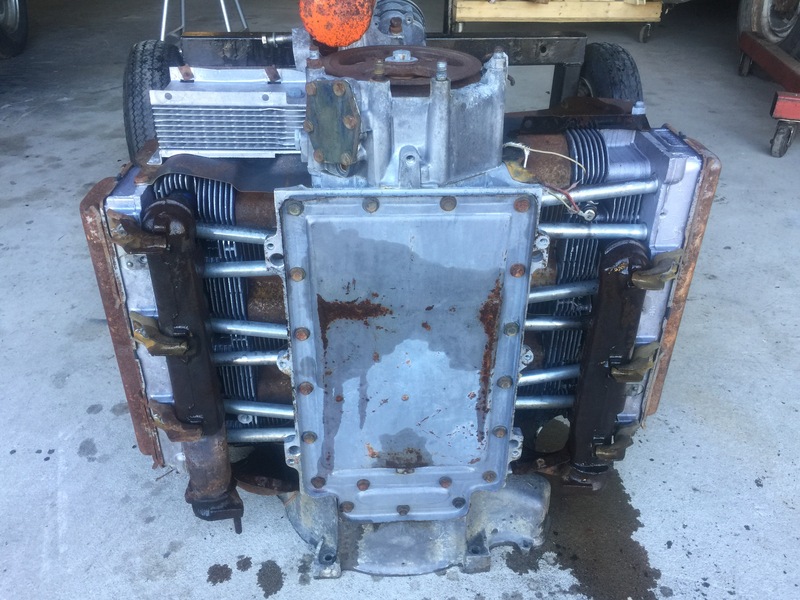 What I am wondering is if the head is going to be rebuildable or was it junked by the corrosion processes that took place in that one cylinder. I would hate to think that two heads are now going to the recycler and it took two cores to make one good engine worth of parts for a project.